I was fortunate enough to have my bathroom vanity makeover featured on Hometalk yesterday. In response, I received a lot of questions about the other items featured in the bathroom that I never shared with you, so I wanted to provide you with all the details today. If you want to learn about the vanity project including the paint color and hardware visit my first bathroom post. Originally, my plan was to hire an electrician to hang two separate lights over each sink and get two mirrors as well because I couldn't find one large fixture that I liked. Then our furnace went out in the middle of February and blew those plans out the window. So, I went on the hunt for a single light fixture again and landed on the Argenta 5 Light Vanity Light by Z-Lite. While this was a big investment, I saved money in the long run by not having to hire an electrician to split the wiring into two separate fixtures, not to mention, patching up the wall. My husband was able to install this himself without the help of a professional. If you plan on installing a light yourself, definitely read over the manufacturers instructions carefully. Electricity is no joke. Make sure you are following all the safety instructions required for working with live wires. If I would have know that I would end up using a single light, I probably would have kept the large mirror up, but I had already taken it down to prepare for painting the bathroom, so I had to replace it. I got the mirror and the cute little boxwood plant from HomeGoods for under $50. The crate and jars on the counter came from Hobby Lobby. For the color of the walls I chose Sherwin-Williams Alpaca. It is a warm neutral that complemented the tile on the floor, shower and tub surround well. This bath is an en suite to our bedroom, so I had to make sure all the colors I selected coordinated with the colors in there. We have really dark espresso furniture and ice blue accents along with walls in Sherwin-Williams Iceberg. That is why I went a little blue on the grey paint I selected for the vanity. Thank you for all your comments and questions! It was so fun reading them all. I even enjoy reading the criticism on my project. I know my style isn't for everyone, and I can be a little strong in my opinions. It was a reminder to me that beauty is in the eye of the beholder, and I am fortunate to have all that I do. And if you haven't ever visited Hometalk, you are missing out. It is a great place to find projects and inspiration for any part of your home or outdoor space. Check it out! 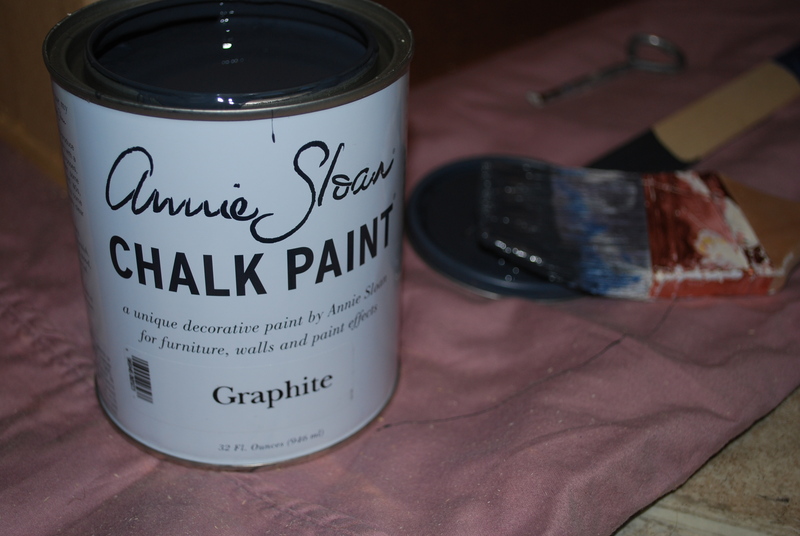 After I bought my first supply of Chalk Paint, I wanted to paint everything with it. I hadn't gone thrifting yet, so I figured it was time to give something we already owned a makeover. The lucky winner: my husband's dresser! I've had it since I was a baby and brought it with us when we moved into our first place together. It was serving its purpose quite well, but it wasn't much to look at. If you've read my About section, you know we live in a tiny apartment, and it's definitely not our forever home. I have a hard time decorating, because I know we wont be here for long and that's why I like to sell my pieces as well. For this dresser, I kept it relatively neutral so we can take it with us whenever we move. 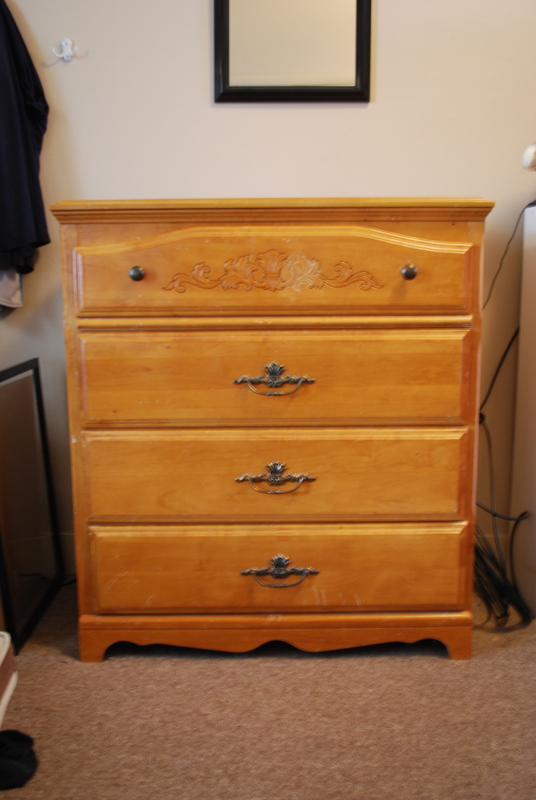 Here's what the dresser looked like before I started the transformation. I don't mind the engraved design on the top drawer, but the hubs, not so much. This thing needed to be more masculine. 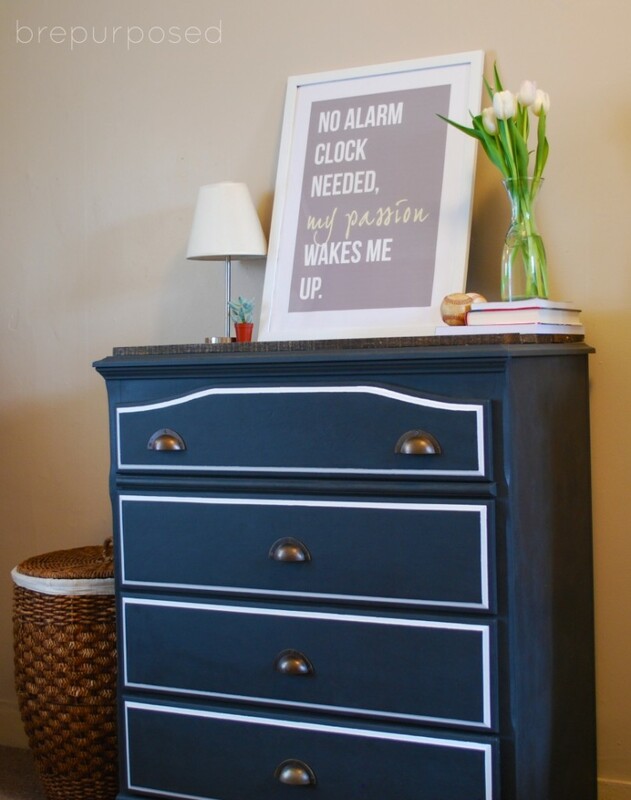 I used Chalk Paint in Graphite, which I never would have known was a dark grey unless I had seen it in the store. It looks like Black on the website. It's still a dark color and I wanted to give it some contrast with a white border around each drawer. 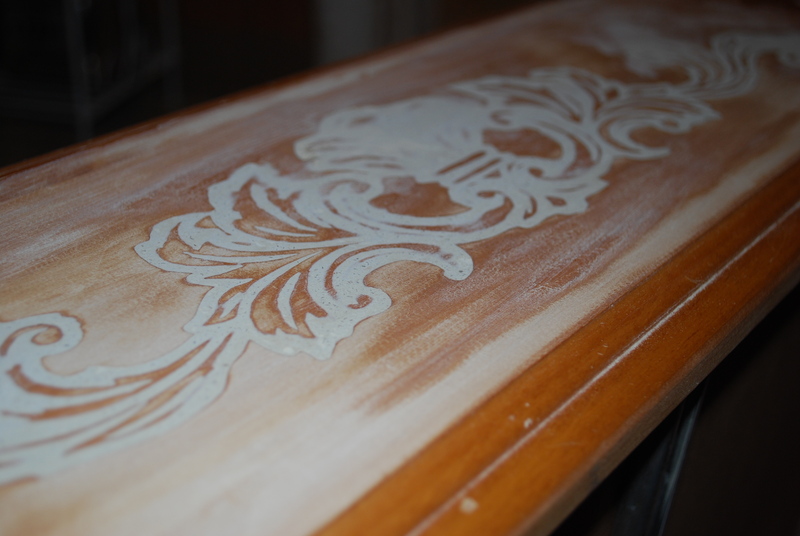 Since I was using Chalk Paint, no sanding or priming needed! First step was filling in that design and the holes, for new hardware. I used Elmer's Wood Filler and had to do about three rotations of filling and sanding to get it to be completely smooth. Time for the paint! 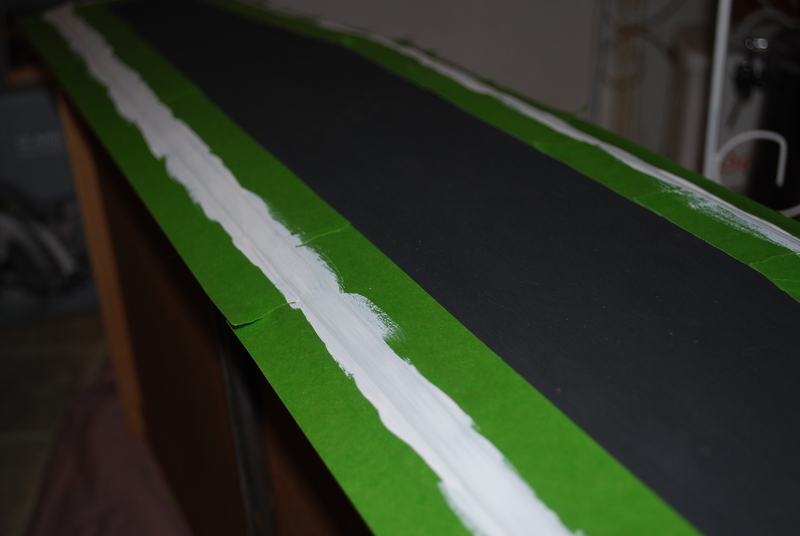 I did two coats and after that dried, I used Frog Tape to tape off the white border. I used some leftover white trim paint I had laying around and did two coats of that as well. Once the white dried, I used Clear Wax to coat the drawers. I'm still getting the hang of this stuff, and feel like this time around I had more trouble than the first. After applying, and buffing off, it looked a bit blotchy to me. Not sure if this had to do with the way I painted, or the way I applied the wax. Either way, applying some more and buffing in spots that looked untouched helped to minimize the blotchiness. Due to the cold weather, I painted this baby right where it stood. I propped it up on some wooden blocks and painted the body of the dresser. I used the rest of the pallet board I had left over that I used for my Tray and cut the pieces to size using my circular saw, in our kitchen once again. I followed pretty much the same process that I used for my tray. 1.) cut 2.) sand 3.) glue 4.) 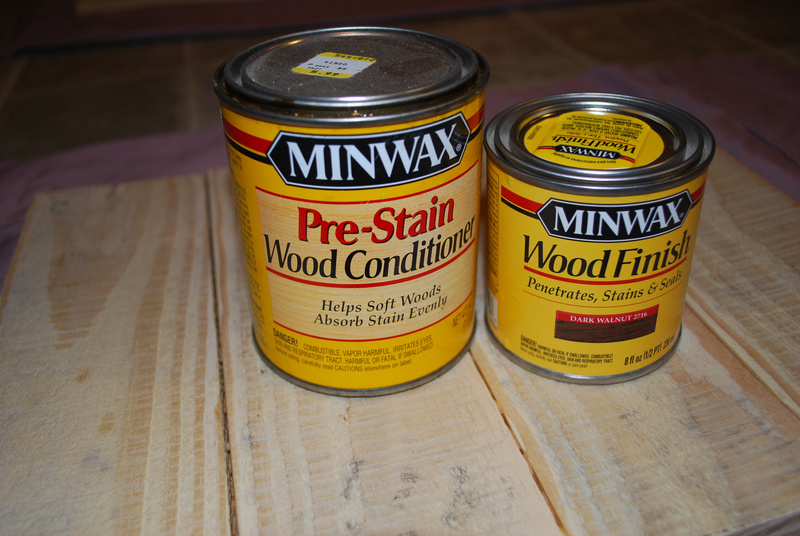 wood stain conditioner 5.) stain and 6.) poly. Once the top was dry, and the dresser was ready to go, it was time to attach. I used some wood glue first, but some of the boards were a bit warped and didn't sit very flatly. 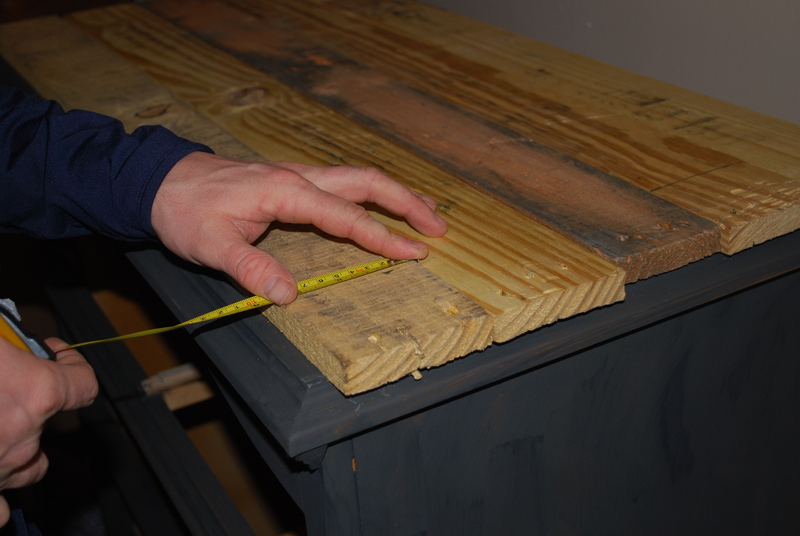 To fix that we just used some regular nails and nailed the boards to the dresser securely. I finished this piece a while ago, but originally had chosen different hardware. Once I changed my mind, Hobby Lobby was one short of the pulls I needed. I had to wait almost a week for them to get restocked and then I could take my pictures. Note: it takes Hobby Lobby 2-3 days to unload their truck, boo. Now this is looking more manly isn't it?! 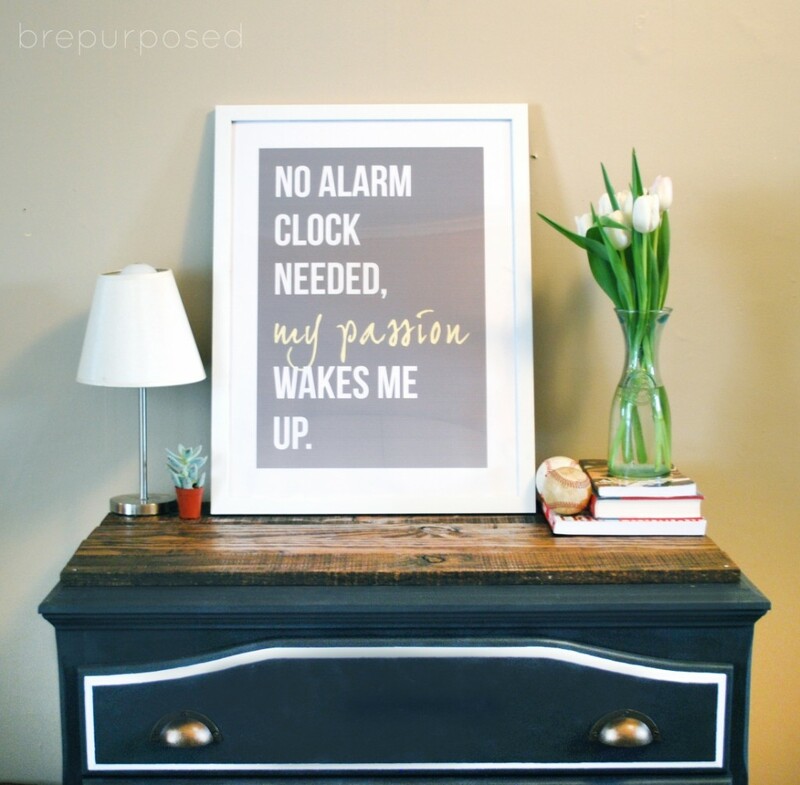 The quote is from Eric Thomas, my husband's favorite motivational speaker. I designed it in Illustrator and printed it out for a frame we had laying around. Thanks, Bre, for sharing this amazing makeover! What a girl after my own heart. She had me at Annie Sloan and Hobby Lobby. 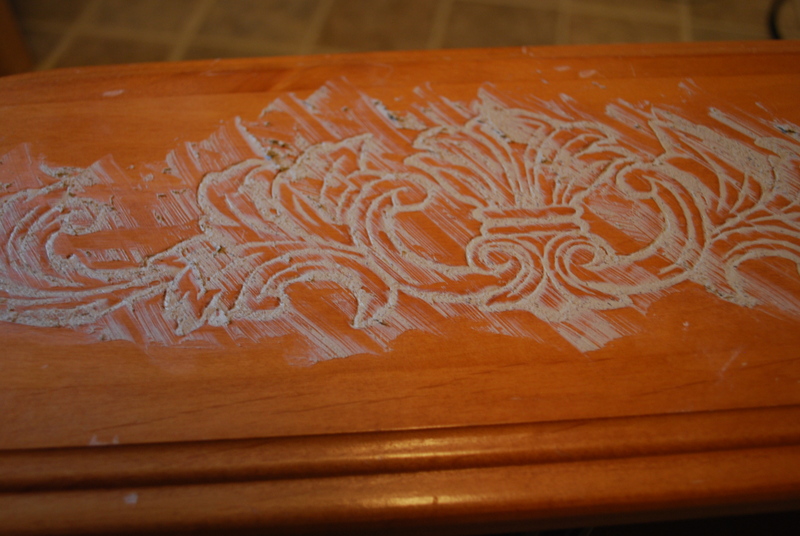 As you can see, Chalk Paint® decorative paint by Annie Sloan isn't just for distressed, shabby looks. 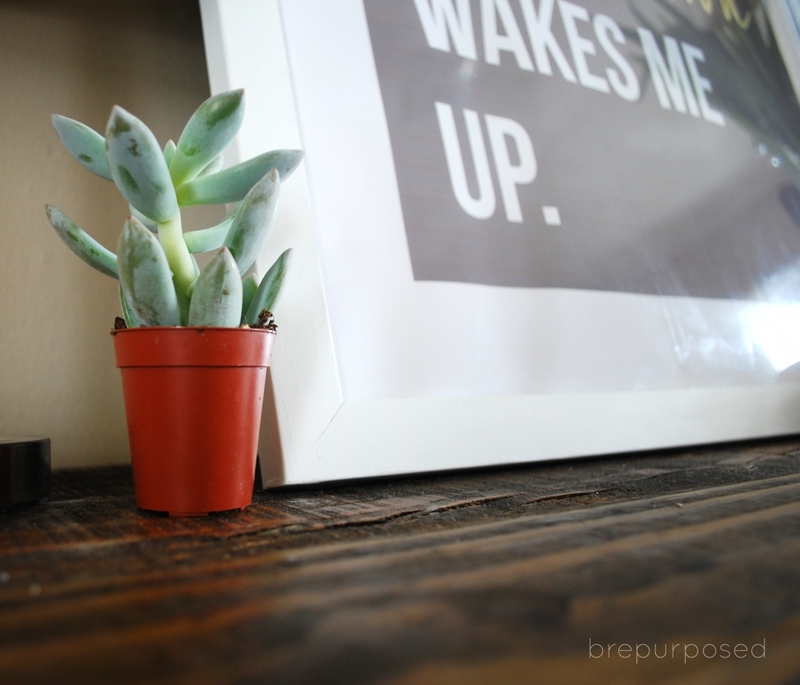 Thanks again, Bre, for showing us how to get a modern, manly finish with my favorite paint. Don't forget to check her out over at brepurposed to see more of her projects. I am a big fan! I look around my house sometimes, and all I can see are the mountains of projects I need to tackle. It is often hard for me to pause and reflect on just how far we have come on our journey of making this house a home. Today, I want to take the time to slow down and enjoy my foyer. Let's start with the walls. 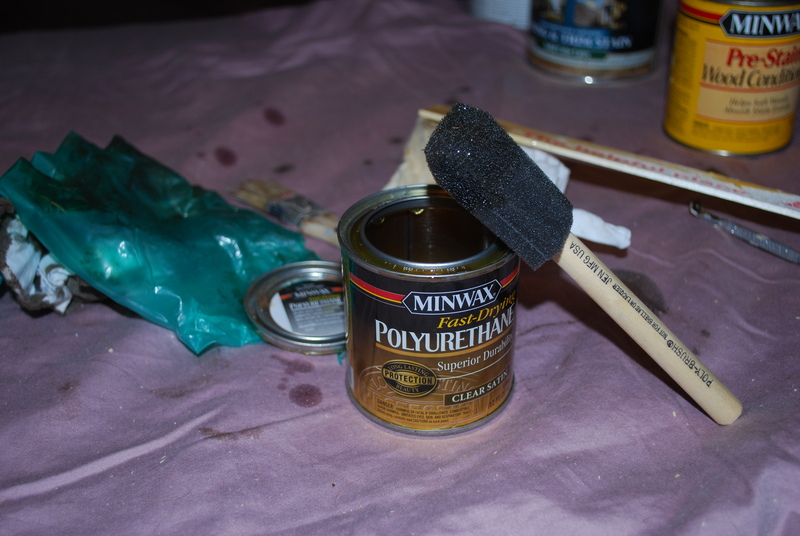 I wanted to brighten things up with a cool neutral, so I selected Sherwin Williams Pediment. This baby has been in the Pottery Barn Collection for a couple of seasons, and it is really beautiful and versatile. I used SW Emerald paint for this job since the foyer will take on a lot of heavy traffic. It is super durable and wipes up really well. The old flooring really chopped the house up- tile in the foyer, vinyl in the kitchen and carpet in the living, dining and family rooms. We selected Morning Star's Solid Antique Strand Handscraped Bamboo from Lumber Liquidators. 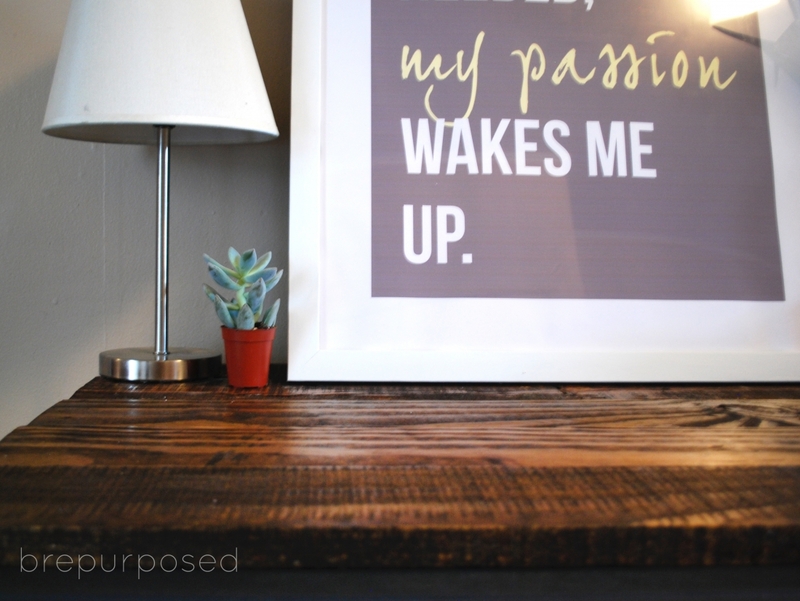 This wood is really stunning, and the hand scraped aspect really gives it a rustic look. 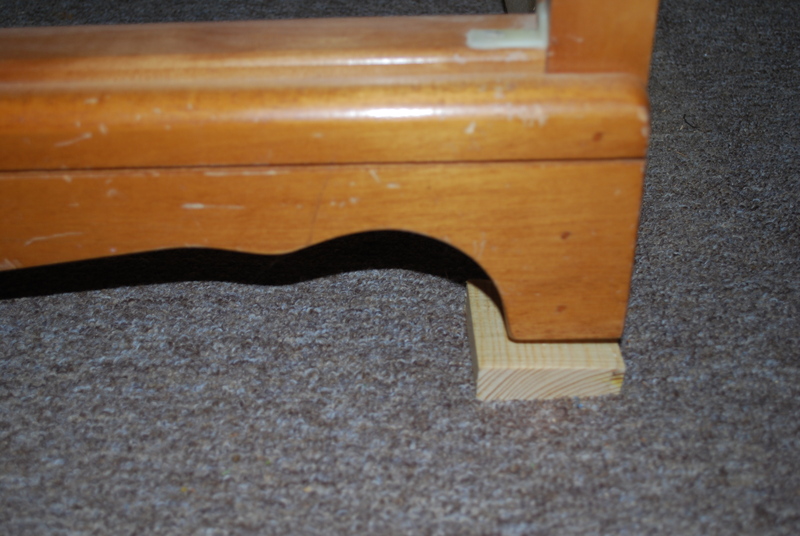 We also added new, taller baseboards. Thanks to my new found love of refinishing furniture, I was able to decorate this space without breaking the bank. 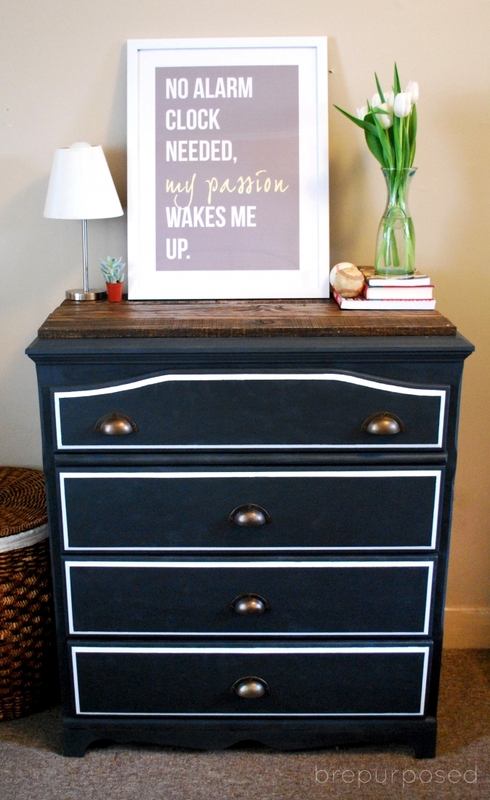 The dresser is from Goodwill and the shutters were from my mom's garage. The metal orbs are from Hobby Lobby, and the rest of the items on the dresser are from HomeGoods. I didn't pay over $15 for any item. My bench and rug are also from Hobby Lobby, and I had those left over from our previous house. I also made the pillows myself. I am hoping to eventually replace the chandelier in the foyer. I conveniently cropped it out of these photos. It is glass, brass, and ugly. I also plan on staining and painting the banister this fall once the weather warms up, and I can ventilate this puppy. But I refuse to dwell on any of that today. Today, I am enjoying my foyer and how far it has come! Take some time today, and bask in one of your recent accomplishments. You deserve it!